DA Form 7534-1 - also known as the "Odt Training Plan And Mission Statement" - is a United States Military form issued by the Department of the Army. The form - often mistakenly referred to as the DD form 7534-1 - was last revised on July 1, 2014. Download an up-to-date fillable PDF version of the DA 7534-1 down below or look it up on the Army Publishing Directorate website. For use of this form, see AR 350-9; the proponent agency is DCS, G-3/5/7. 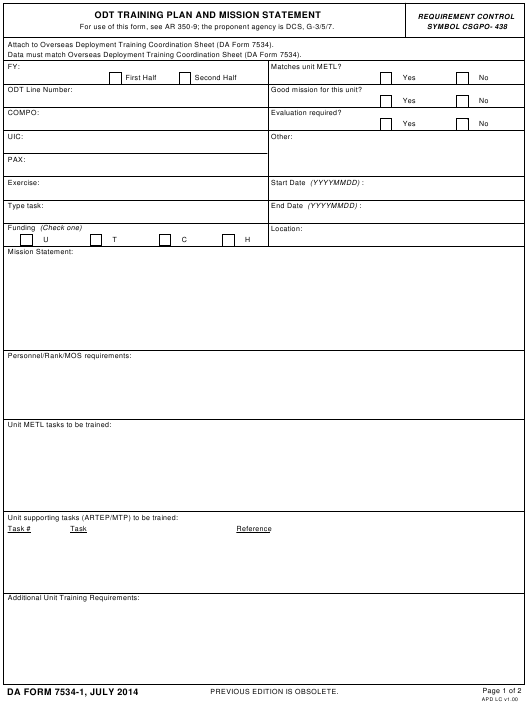 Attach to Overseas Deployment Training Coordination Sheet (DA Form 7534). Data must match Overseas Deployment Training Coordination Sheet (DA Form 7534). Good mission for this unit?